Insurance is a very important ingredient in the recipe to keep a business going after a disaster strikes. Yet, insurance alone will not guarantee that your Company will retain its customer base during and after the recovery period. Therefore, it is important to develop a business disaster plan that will focus on two strategies – to get back into business as soon as possible and, secondly, to keep your clients happy during the down period. Many services and retail businesses have the advantage of relocating quickly and returning as a functional operation in a short period of time. Proper insurance coverage will pay the “extra expense” to set up shop and promptly replenish lost inventory and equipment. Most manufacturers, however, cannot relocate and must stay put in a nonproductive mode until the facility is repaired. Make a deal with a friendly competitor to manufacture your product or service your customers during the recovery period. Your Company must be prepared to do the same if your colleague suffers a loss. Keep backup records and computer discs away from your headquarters so that they can be accessed easily and utilized if the originals are destroyed. Store a few months inventory of goods at another location so that your customers will continue to receive your goods even if you have no manufacturing capability. Seek out alternative suppliers beforehand so you don’t have to scramble if your major supplier suffers a loss of their own. 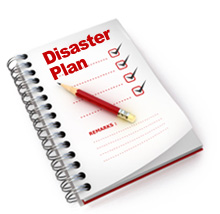 A copy of the disaster plan should be given to each manager so that he or she can refer to a specific emergency action plan. The manual should contain the names, addresses (including email), phone and fax numbers of key vendors, support personnel, and customers. Some larger Firms have gone so far as to have a duplicate second office already set up in case of an emergency. You will find that for the most part the public will be supportive and sympathetic regarding a Firm’s setback because of a loss. Nevertheless that support will wane unless it is perceived that you are determined to get back into business – fast!